ANONYMOUS COMMENT: "Police Chief Danny Macagni Should Resign"
LYNN MELVILLE Says Guad Dirt Not Just "Dirty Dirt"
POLICE CHIEF DANNY MACAGNI: "Stupid Wetbacks" - "Damned Mexicans" - "Niggers" - and "Chinks"
SM CC: Who Really Runs Santa Maria? TIM NESS: "Should Be a Tobacco Executive"
It's interesting to note how the percentage numbers have changed since the Who Really Runs Santa Maria? post (Results from 08/24/05 )in the August 18 - 25, 2005, issue of the Santa Maria Sun was posted here on August 24th. As you can see from the link, Tim Ness came in at 59 per cent, with Mayor Larry Lavagnino trailing at 27 per cent. Evidently Lavagnino didn't like the Sun's poll backing up the recent Grand Jury report that city manager Tim Ness has assumed too much power -- and that the city council wasn't overseeing him properly. To change the percentage numbers so drastically in only three days, Lavagnino must be really out beating the bushes for votes. You, too, can vote. 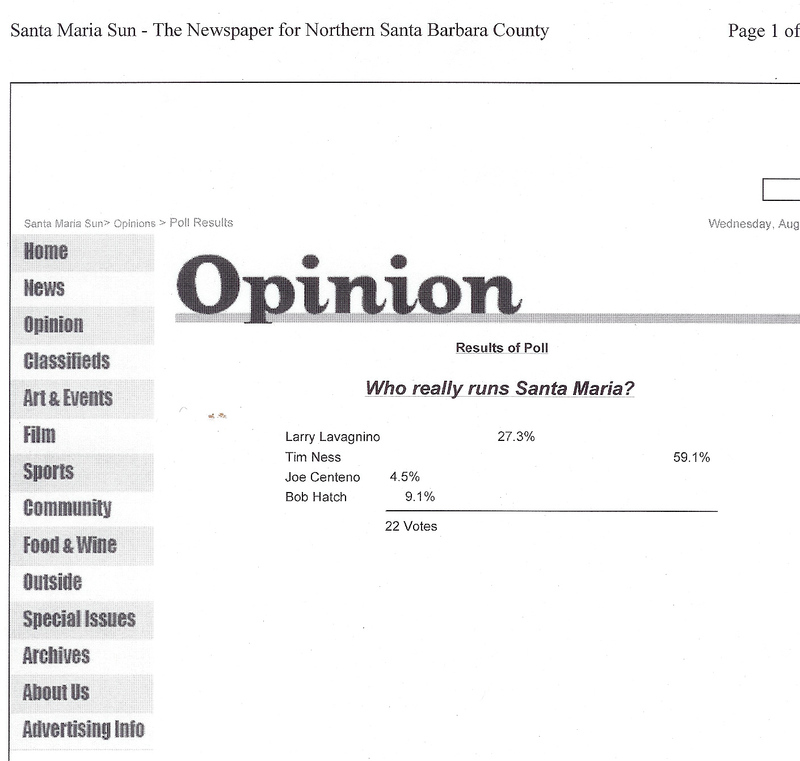 Go to www.santamariasun.com and voice your opinion on who really calls the shots in Santa Maria. Regarding the issue of the Santa Maria landfill accepting tainted, oil-impacted soil, it was noted in today's issue (August 25th) of the Santa Maria Times that, "Before accepting any tainted soil, the city received the proper approval from the Regional Water Quality Control Board, the California Integrated Waste Management Board, and the county." This information was noted by city Utilities Director Dwayne Chisam and city solid waste and utilities engineer John Zhao. QUESTION: What about "proper approval" from the citizens of Santa Maria? Why didn't our city council -- the people we elected to represent us -- tell us this was happening? Why weren't we at least given a chance to be informed and have some input? The Times notes that, "Santa Maria held a public hearing July 20 that included the question of accepting tainted soil from the Guadalupe Dunes . . . ."
QUESTION: Where was the public notice of this July 20th meeting? How can there be "public testimony" if there's no public notice? So I guess we're all supposed to swing by Starbucks, pick up a cup of coffee, and drive out to the Guadalupe Dunes to be informed citizens. In Santa Maria Public Works Director Paul Karp's commentary in the Santa Maria Times on August 23rd, he states, "Three years ago, the city obtained approval from state and local regulatory agencies to accept and encapsulate the non-hazardous volumes of oil impacted soil at the landfill." If the soil is "non-hazardous", why was it necessary to excavate and isolate it from the groundwater -- and then stockpile it at the Guadalupe Beach? And more importantly, when and where was the public notice that the City of Santa Maria was applying for approval to accept the oil impacted soil? Again, in light of the recent criticisms by the Santa Barbara County Grand Jury against city manager Tim Ness for assuming too much power -- and the City Council for not overseeing him properly -- one has to wonder who was really in charge of this application. Someone from the city should post a comment on Sound Off Santa Maria explaining when the public was notified of the impending application to accept what Toru Miyoshi termed "860,000 cubic yards of contaminated sand" in his commentary in the Santa Maria Times on August 10th. Today's Santa Maria Times contains a commentary regarding the Cambria tainted water issue from Paul Karp, Director of Public Works for the City of Santa Maria. According to the April 1, 2003, San Luis Obispo Tribune article, "The residual water is left over from Chevron Texaco's cleanup of Cambria groundwater contaminated with MTBE. That treated byproduct is dubbed 'MTBE-impacted water,' a technical term that falls somewhere between drinkable water and hazardous waste." The Tribune article also states that the Cambria Water District actually "mounted a petition drive and organized a campaign to block the plan" to dump this "MTBE-impacted water" in the Cambria creek. If this "MTBE-impacted" water is so drinkable, as Karp says, why did Cambria fight so hard against it? And if Cambria didn't want it, why are we so eager to have it shipped down to our water treatment plant? SM Water Accepts All Kinds of "Gunk"
I just located that San Luis Obispo Tribune article regarding Cambria water that Toru Miyoshi was referring to in his commentary in the Santa Maria Times on August 11th. It seems that "10,000 gallons of water are being trucked daily from Cambria to Santa Maria as part of a clean-up of ground water tainted by a gasoline additive." Oh, really? 10,000 gallons a day? And the Santa Maria residents were never informed of this? The article goes on to say that MTBE "can cause flulike symptoms and has been suspected -- but not proven -- to cause cancer." Evidently "no public review or City Council approval was required for Santa Maria to take the MTBE-tainted water. The city has an approved program [Tin Soldier: By whom?] that allows 'us to accept all kinds of things we can treat,' including gunk from other areas, said Santa Maria head of Public Works, Paul Karp." I just read the August 11 - 18, 2005, issue of the Santa Maria SUN newspaper. News Editor Andrea Rooks did a good job of summing up the criticisms of the 2004 - 2005 Santa Barbara County Grand Jury against Santa Maria's city manager, Tim Ness, and our City Council, and their responses. As Rooks notes, after "20 interviews, 15 subpoenas for sworn testimony and three subpoenas for personnel documents," the Grand Jury found, among other things, that the "City Council is not exercising sufficient oversight of the city manager." On July 19th, the Santa Maria Times stated that the Grand Jury believed the City Council needed to "oversee the city manager's office more closely to prevent too much power from being concentrated there." Then on July 29th, Dan Milstein, deputy executive director of the Santa Barbara County Action Network, joined in with his commentary in the Santa Maria Times. He stated, "Even though the City Council was charged with giving too much power and too little oversight to the city manager, the Council let the city manager write the City Council's reply to those charges." Milstein goes on to say, "To the city's credit, it has accepted the Grand Jury's recommendation that the city manager submit to an annual written performance review . . . . " However, he asks the question: ". . . will the City Council write the evaluation themselves or will this task also be delegated to the city manager?" And then, of course, there's that Santa Maria Times letter to the editor on July 25th from Audrey Mussell. She says, "Word is, once you've made Ness' 'hit list', it's just a matter of time before you are added to the casualty list." I wonder what forced-to-retire former Police Chief John Sterling would have to say about Ness having too much power and his "hit list"? Finishing her piece in last week's SUN, Rooks also interviewed Santa Barbara City Administrator James Armstrong. Armstrong says, " . . . the city manager serves at the pleasure of the City Council . . . . You have to keep the majority of the City Council happy." Ness must be doing that, because he's still city manager. But then, when Rooks spoke with King Harris, managing editor of San Luis Obispo's New Times newspaper, he noted that Santa Maria's City Council "doesn't have the balls that the City Council here does." No balls. Could this be why Tim Ness is allowed to have a hit list? We haven't been told yet how much money changed hands, but one would assume that it was a pretty hefty chunk of change for our public officials to be willing to risk the residents' health in this manner. So it worked so well (no one in the public complained, because they didn't know about it) -- our city officials decided to go for it again. This time they were really into the big bucks. As retired attorney Dan Kirk said in his August 3rd letter to the editor, San Luis Obispo is willing to pay Santa Maria $12.5 million to get its contaminated dirt off its hands. However, the SLO County Planning Commission is so concerned about the contamination level and toxicity of this dirt that it's requiring the actual tires of the hauling trucks to be cleaned before they will even allow them to be driven on their roads. SLO not only doesn't want the dirt on their hands, they don't want the dust under their feet. And Santa Maria is going to allow that dirt to be dumped in our town, so it can be blown all over the city with our high winds? Who is responsible for allowing this agreement to be finalized with absolutely no public notice or opportunity for the residents to comment on it or make their wishes known? The citizens of Santa Maria deserve some answers. There's an interesting question regarding the issue of Cambria dumping its toxic water into Santa Maria's water system. My information tells me that Santa Maria's former city attorney, Arther (yes, that's how he spells his name) Montandon, was also serving as attorney for the Cambria Water District when this deal was cut. In fact, when Montandon retired from Santa Maria in 2004 (after getting into trouble with the Santa Barbara County District Attorney's Office in 2003 for interfering behavior in the ongoing investigation of a criminal case), he went to work full time for the Cambria Water District. Now, I'm not an attorney, but I do read books and watch television. Isn't this called a conflict of interest? Isn't it considered unethical to represent both parties in an action? Perhaps some of our local attorneys will comment here on SOSM and enlighten us in this area. Obviously, Montandon has the Santa Maria Chamber of Commerce snowed. Something sure sounds fishy here -- not that any fish could live in the water we've been drinking. Former Santa Maria City Council and Santa Barbara Board of Supervisors member Toru Miyoshi landed a bombshell in the August 10th commentary section of the Santa Maria Times. It seems Cambria has a problem with Chevron Corporation pumping water from an underground area contaminated with methyl tertiary betyl ether (MTBE). Regarding MTBE, the Environmental Protection Agency has determined that "the data support the conclusion that MTBE is a potential human carcinogen in high doses." Cambria is concerned that this contamination threatens their municipal drinking-water wells. So Santa Maria has come to their rescue -- allowing Cambria to dump their contaminated water into the Santa Maria water treatment plant. Miyoshi correctly asks, "Who authorized this?" Was it the same Santa Maria city manager -- Tim Ness -- who was criticized in this year's Santa Barbara County Grand Jury report as having "assumed too much power"? Or did Ness go forward with dumping toxic waste in our water with the approval of our City Council members? One of the responses the City Council made to the recent Grand Jury criticisms regarding their lack of oversight of Ness was their glowing reference to Santa Maria's sound financial condition. According to the City Council, this is due to Ness' superior job performance. How much money did it take for Cambria to buy Santa Maria off? What was the price paid by Cambria to induce Santa Maria officials to allow toxic water to be dumped into Santa Maria's previously clean water, thereby risking the health of all the city's residents? Did our public officials trade our health in order to balance the city's budget? And lastly, when did our public officials start drinking bottled water without warning us that we needed to be doing the same thing? At this point in time, counting Sound Off Santa Maria, there are three blogs in the Central Coast. The weekly Santa Maria SUN newspaper focused on the other two blogs in their cover story a week ago. Central Coast News Mission is a collaborative blog, according to my previous post -- What's a "Blog"? -- which described the various types of blogs on the Internet. It's maintained by one owner, Lompoc resident Greg McClure, with many local authors contributing their commentary. Times newspaper with locally oriented commentary, so his blog is an excellent tool to spread the word. How many blogs will the Central Coast have by this time next year? Creating your own blog is incredibly easy and fun -- even if you're a novice with computers. I've listed a couple of the more popular blog maintenance services below. You can also use Google to search for ["free weblog"] and [weblog "free hosting"] (omit the brackets and keep the quotation marks). But free may not have all the features desired. Many of the services charge only $5.00/month -- a good deal. You might also visit other blogs on the Internet and see which ones you like -- then go with the service they used. According to blog search engine and measurement firm Technorati, 23,000 new weblogs are created every day -- or about one every three seconds. Good luck with yours -- and I look forward to linking with you. We've all heard the term "blog" tossed about, but what is it, really? I picked up Hugh Hewitt's book entitled Blog - Understanding the Information Reformation That's Changing Your World recently. I was fascinated to read of all the active blogs - poliblogs (political blogs raising huge sums of money for politicians), warblogs (after 9/11), milblogs (military) and faithblogs (Christian blogs) -- just to mention a few. As I understand it, blog originally started as the word weblog -- a sort of online personal journal/diary, with links to web sites that the owner enjoyed. Weblog was cumbersome to say, so the short form blog was born. As Hewitt says, "The gatekeepers have lost their power." More colorful to read about blogs is Rebecca Blood's book "The Weblog Handbook -- Practical Advice on Creating and Maintaining Your Blog". You can order it on her blog. Also posted on her site is a full "History of Weblogs". A weblog is a coffeehouse conversation in text, with references as required. A weblog is a text version of ham radio. A weblog consists of commentary with the new stuff on top. In the weblog universe, everyone can say his piece. The weblog phenomenon is democratic. Webloggers seek to put the news into a larger perspective. Weblogs excel at exposing and explaining flaws in media coverage. Marginalized voices, dissenting viewpoints and obscure web sites all flourish in the weblog universe. Weblogs can perform a valuable function as critical disseminators of pertinent information. The weblog's strength is fundamentally tied to its position outside of mainstream media -- observing, commenting and honestly reacting to both current events and the media coverage they generate. A weblogger's commentary may provide insight into current events and may provoke the reader to more fully consider his own point of view. Weblogs that are maintained by information junkies are likely to bring to the attention of their readers web sites and articles that would otherwise go unnoticed. Webloggers who link to one another recognize their ability to leverage virtual social connections into networks, enabling each of them to amplify his individual voice. The Web has circumvented all the gate keepers, and now everyone with a web page has the means to reach an audience of like-minded individuals. Blogs: Resemble short-form journals. The writer's subject is his/her daily life, with links subordinate to the text. Notebooks: Distinguished from blogs by their longer pieces of focused content. The weblogger's ruminations are front and center. The blog tends to focus on the weblogger's inner world and their reactions to the world around them. They tend to be less a record of external events than a record of ideas. Filters: (1) Organized squarely around the link -- maintained by an inveterate Web surfer -- personal information strictly optional. These filters have one thing in common: the primacy of the link. They want to show you around the Web. The self, when it appears on a filter-style blog, is revealed obliquely, through its relation to the larger world. (2) Collaborative weblog (such as Sound Off Santa Maria) -- maintained by a group of people, rather than one individual. They range from sites on which any member can post and comment, to those on which the site owner posts to the main page and members contribute in discussion forums. And finally, Rebecca Blood says: Weblogs invite participation in another way -- they produce webloggers. One Tin Soldier would like to invite other people in the Central Coast to start their own blogs. The more people we have blogging -- and linking to each other's blogs -- the more accurate will be the picture of what's occurring in our cities and the greater will be our voices in getting the changes accomplished that we feel are necessary. My next commentary will contain information on how to use one of the blog maintenance services available to very easily start your own blog -- even if you're a complete novice on the computer. The 1960's was a time of great social unrest. College students were objecting to young people dying in a far-off war in Viet Nam that seemed to make no sense. Martin Luther King was speaking eloquently against prejudice and for civil rights through nonviolence. And the City of Watts in Los Angeles was so angry it burned itself down. In addition, the social message of rejecting money and materialism in exchange for simply loving and caring for one another (the message of every great spiritual leader the world has ever known) was being danced in the streets by hippies. It was a time of great unrest and upheaval. It was during this time that the movie Billy Jack came on the scene. The character Billy Jack is a warrior, a mystic, and a martyr who captured the heart and soul of a generation. Tom Laughlin stars as Billy Jack, a half-breed Indian Hapkido Karate master and ex-Green Beret returning to live in solitude on an Arizona reservation. He's drawn to the progressive Freedom School -- and the idealistic woman who runs it. But when tensions flare between the students and narrow-minded locals who fear what they cannot understand, Billy Jack becomes their protector. With the help of a socially tolerant sheriff, Billy Jack appears throughout the film to defend the weak when injustice appears on the scene. As social commentary, the film had tremendous impact on those people trying to effect change in our country, since it seemed to embody the spirit of the yearning for social justice that was in the air -- the desire to break with the past, stop the prejudice that was crippling our people, and begin again anew. It was a bold, daring wish. Today, churches are still filled with people struggling to love one another and the people in their world. Civil rights legislation has leveled the playing field somewhat -- for all minorities, including women -- but we still face daunting tasks when it comes to learning to live side-by-side peacefully with one another. Billy Jack stands as a period piece of the 60's -- but its message is just as relevant today in our town of Santa Maria as it was when the movie was made. The Santa Barbara News-Press ran a series of articles in 2004 on the Oaxacans. According to the quoted statistics, the population in the town of Santa Maria proper (excluding the Orcutt area), is 60 - 70 per cent Latino, with 28,000 of those coming from one small village on top of a mountain range in Oaxaca, Mexico. The News-Press also stated that the Mixtec Indians represent 80 per cent of the Santa Maria Valley farmworkers, with 90 per cent working as strawberry pickers. These numbers are 10 times what they were in the mid-1990's. The series went on to say that the Oaxacans have been unable to sell the corn that they have traditionally raised for decades in Mexico at a price that would afford them a living wage. The News-Press stated that the subsidies given by our federal government to corn-growing American farmers have allowed those same farmers to undercut the traditional price of corn in Mexico. The Newspress states that America is now the primary supplier of corn to Mexico. So the Oaxacans have fled their homeland -- coming to pick strawberries in Santa Maria, San Diego and Oceanside -- in an effort to earn a living. This large influx of people has presented challenges to our city regarding adequate housing, health care, crime prevention, etc. The Legend of Billy Jack is the theme song of the movie Billy Jack. It offers challenges to the people of Santa Maria to question what it means to live as a human being -- what it means to live in peace with one's neighbors -- what the future of the town holds, when such a large portion of the population is Latino. One Tin Soldier believes that the Sound Off Santa Maria weblog will allow a free forum within which the local citizens can voice their concerns, share information, require accountability from their elected officials, and come to agreement on the issues which so concern us all. There are many other issues of concern besides how to assimilate the Oaxacans. How much growth do we want? What about our water quality? How many more big box stores are we willing to allow? Are our children graduating from school with the full knowledge that many of our American jobs have gone overseas? Just how will our children support themselves? The future is now. The town we work on today is our town of the future. What will Santa Maria be like ten years from now? The choices are ours. What are your thoughts about Santa Maria? Are there issues or problems you feel should be taken care of but aren't? Do you have concerns about things happening in our community that you feel others should know about? Are you aware of laws that are being broken -- or persons or groups being discriminated against or harassed -- but have been afraid you would be fired or your business would suffer if you came forward with the truth? This blog is for you -- a safe place to anonymously post your information and opinions without fear of punishment. If you don't feel comfortable posting a comment in your own name, sign up for a free, anonymous email address here and tell the community what you know. An anonymous email address could also come in handy if you wish to forward information -- without revealing your identity -- to another person posting a comment here. All it takes for evil to succeed is for good men and women not to speak up. Stand up for your town and make your voice heard. POLICE CHIEF DANNY MACAGNI: "Stupid Wetbacks" - "Damned Mexicans" - "Niggers" and "Chinks"
Descargar on ANONYMOUS COMMENT: "Police Chief Danny Macagni Should Resign"
wrong on POLICE CHIEF DANNY MACAGNI: "Stupid Wetbacks" - "Damned Mexicans" - "Niggers" and "Chinks"